Home › Blog › Dentists Are Doctors, Too! Dr. Sevey and Dr. Sigwart, your Bangor dentists explain how dentistry is a specific branch of medicine, and what it all means for the link between oral health and overall wellness. 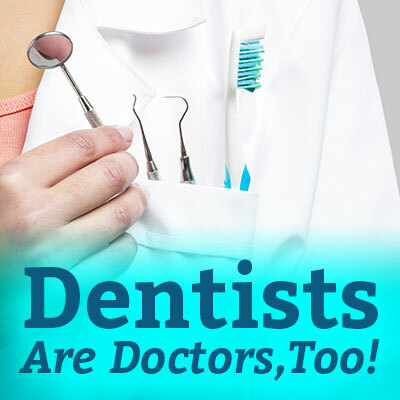 Dentists are every bit as trained and educated as physicians. They have the same general education in science as physicians before they get clinical training in dentistry. This background education helps dentists look at you, the whole package, when taking care of your teeth. Is your image of the dentist expanding in your mind? Have you had your whole printer get jammed because one tiny piece of paper is out of line? It’s endlessly frustrating and time-consuming, and a reminder that machines require all parts, big and small, to be in good shape to get the job done. You are not a printer, but you are made of countless cells, organs, muscles and bones that all work together to make you human and allow you to survive and be healthy. Dentists look at your mouth, gums and teeth, but they also look at your jaw (TMJ), face, head and neck, keeping an eye out for signs of a problem such as swelling, discoloration, and more. Often times, dentists also perform tissue biopsies, diagnose illnesses, and screen for high blood pressure and oral cancer. Dentists can tell just by the look of your mouth if you might have other health issues like stress, chronic inflammation or poor quality of sleep. Seeing the dentist regularly is important for assessing your risks for health conditions all over your body. Periodontal disease is advanced gum disease that’s linked with other chronic and acute illnesses like cardiovascular disease, stroke, diabetes, and more. Good oral hygiene and regular dentist visits do much more than just polish your pearly whites. Everything from eating and sleeping to working and playing depends on a healthy smile. The healthier your mouth is the healthier and happier your whole life will be.